Does John Woodcock have less integrity than bloody Ukippers? 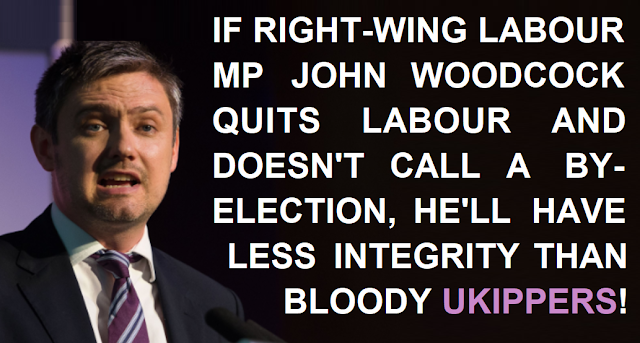 The right-wing Labour MP John Woodcock is one of the most duplicitous wreckers in the entire party. Whenever there's an opportunity to attack Jeremy Corbyn and the hundreds of thousands of Labour members who support him, Woodcock is always at the forefront slinging as much political abuse as possible. 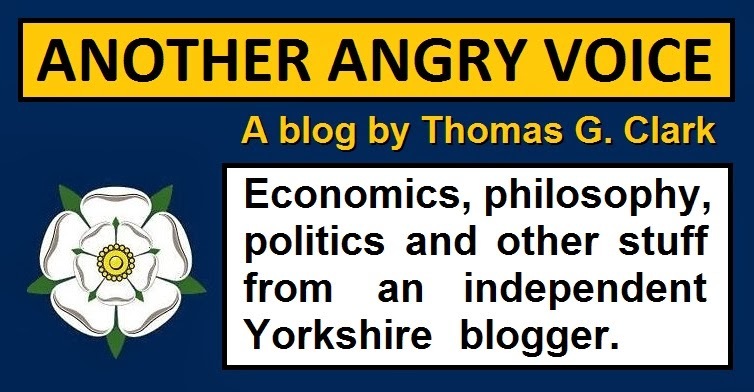 Now it turns out that Woodcock has been going around threatening to quit the Labour Party in order to inflict as much damage on the party as possible before the local elections. The reasons he gives are the usual stuff. The Corbyn's a "Russian stooge" smears (despite the Tories taking £800,000 in donations from Russian oligarchs and Putin cronies and Labour taking £0 since Corbyn took over) and the anti-Semitism smears (despite the fact that Jeremy Corbyn can point to a track record of opposing all forms of racism and bigotry all the way back to before he became an MP in the 1980s). Woodcock is also whining that the Labour MP Dan Jarvis is being asked to stand down as an MP if he wants to become the mayor of the Sheffield region, because of the Labour Party policy of no double-jobbing. Jarvis is trying to claim he should be allowed to do both jobs, but the precedent is absolutely clear. Sadiq Khan stood down as an MP in 2016 to become London Mayor, Andy Burnham stood down as an MP in 2017 to become Mayor of Greater Manchester, and Steve Rotherham also stood down in 2017 to become the mayor of the Liverpool City Region. Why Jarvis thinks he shouldn't follow this precedent is anyone's guess, and why Woodcock has decided that this particular argument is the one he wants to have a final ruinous tantrum over is anyone's guess too. If Woodcock does go ahead with his threat to quit the Labour Party and see out the parliament as an independent MP he won't just be betraying his constituents in Barrow who voted for him to serve as a Labour MP, he'll also be demonstrating that he's got significantly less integrity than Ukippers. When Douglas Carswell and Mark Reckless quit the Tory party in 2014 to defect to UKIP, they at least had the decency to call by-elections to give their local constituents the right to choose whether they were still wanted. By-elections they both won by the way. Woodcock has no intention of doing that because he'd almost certainly lose his seat to the replacement Labour candidate, so he's planning on squatting in the seat for as long as possible in order to attack the Labour Party at every move, which is hardly what his constituents voted for. If Woodcock does go ahead with this threat to quit the Labour Party and then squat in the seat for as long as possible, it'd be proof that he's got less integrity, less regard for his constituents, and less commitment to democracy than the Ukipper fruitcakes on the extreme-right fringe of UK politics!